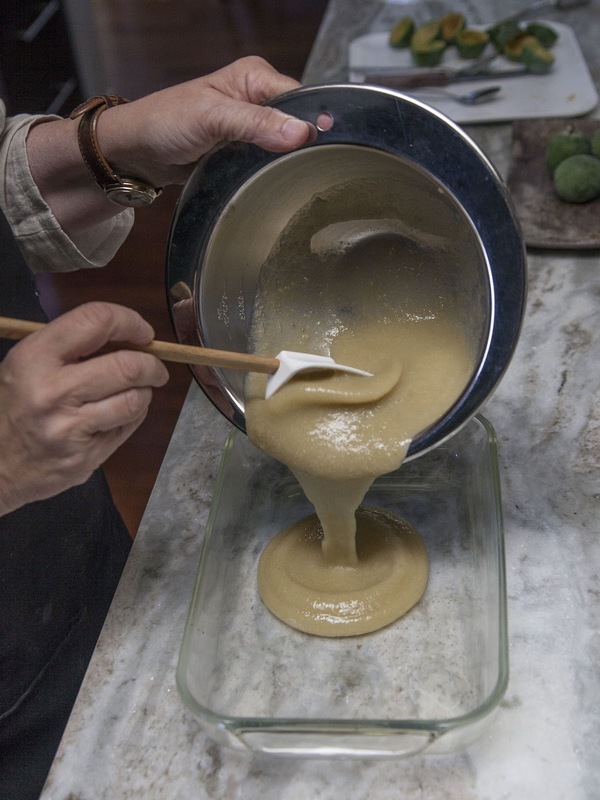 The Colors Of Indian Cooking: When Nature Gives You Pineapple Guava, Make Sorbet. Without An Ice Cream Machine! When Nature Gives You Pineapple Guava, Make Sorbet. Without An Ice Cream Machine! In LA I was always a plant scavenger, a climber of fences, and scaler of walls. I loved going after the stuff people overlooked, the stuff people ignored, the stuff nobody wanted. The one thing that has always driven me crazy is driving /walking past trees and bushes with edibles on them that nobody is using. Virginia Woolf wanted a room of one's own. I always dreamed of a tree of ones own. Here in Sonoma I often see bushes and trees on people's property with neglected fruit. When I can, I glean off the side of the road. I know where the "free" trees and bushes are and I try to take advantage of them. In our old house here we were on top of a hill, overlooking a vineyard. It was impossible to grow anything except herbs, as any other attempts at agriculture was just setting out a free salad bar for assorted critters. So when we bought our new house in town, one of the chief goals was to be able to grow a lot of our own fruit and vegetables. Our house is on just under a quarter of an acre, pretty good space for a place right in town, within walking distance to The Plaza. It has a large garden and we have xeriscaped both the front and back, removing the lawns and putting in 7 large raised beds and fruit trees in the rear of the house. In the front we have drought-tolerant plants and the house came with a number of large established trees, one of which is a large pineapple guava . If you've never had pineapple guava, it tastes a bit like pineapple crossed with kiwi, but yet not. It's a slightly tart, acidic yet sweet taste. It's hard to describe so I'll just call it distinctively tropical. Pretty dang refreshing on a hot Sonoma afternoon. When we first moved in, one of the neighbors glanced at the big tree said, "oh yeah, you're gonna get a lotta fruit off that thing". He wasn't kidding. Back in LA we had a pineapple guava tree in a planter in the back yard in Santa Monica which occasionally gave me a few measly pieces of fruit. This thing we've got is more like a pineapple guava machine. There is no way I'm keeping up with it, but I'm trying. I've been actively seeking out stuff to do with all this fruit. Chutney is one possibility. 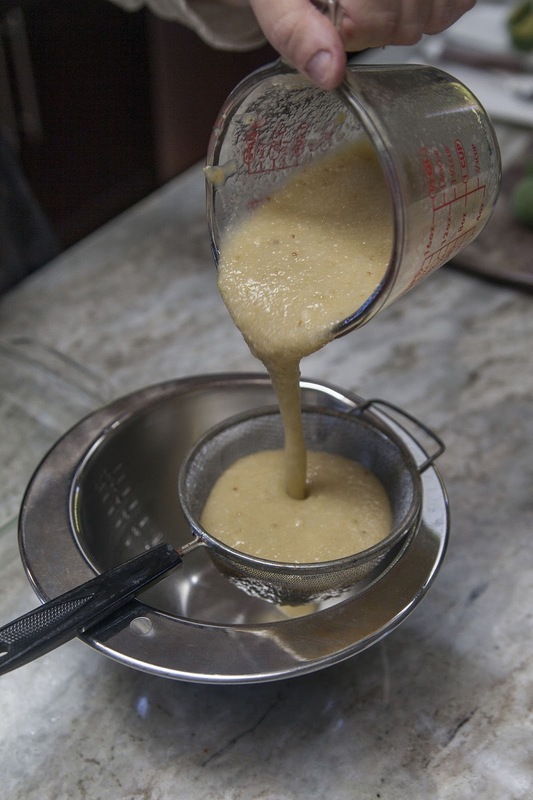 Another is Pineapple Guava Cheese, a form of membrillo. I usually buy the stuff at Whole Foods, but now I'm determined to make my own. I've been collecting all sorts of guava recipes, but as a starter I thought I'd begin with something really simple, sorbet. So simple that one doesn't even need an ice cream machine to make it, just a Pyrex dish and a food processor. 2 cups pineapple guava pulp. Cut the pineapple guavas in half and scoop out the meat. You'll need 2 cups worth. 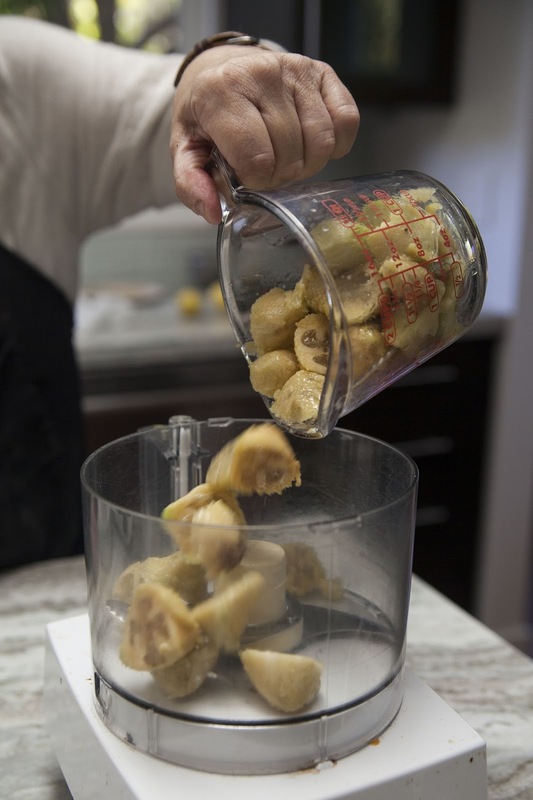 Put the guava meat into a food processor. Add a Tablespoon of Lemon juice. This keeps the guava fruit from oxidizing too much. 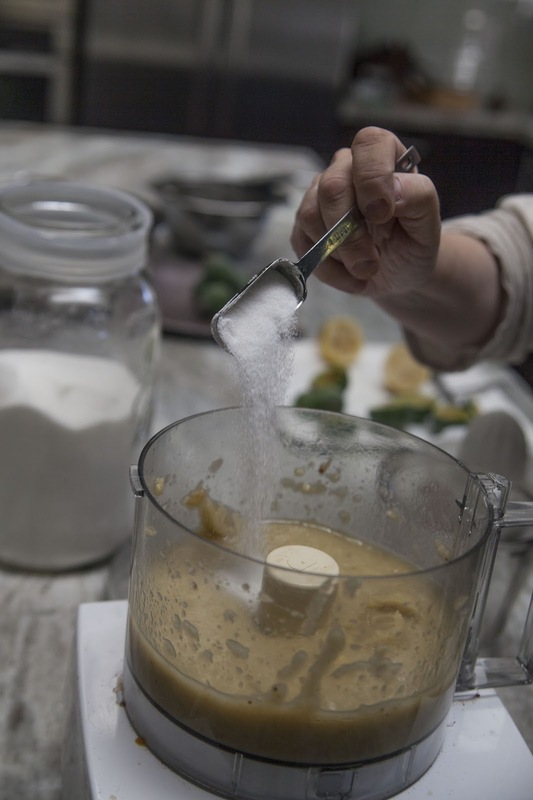 Add in 2 Tbs of sugar and whiz it up. Check the taste. If you feel you need to add more sugar or a tad more lemon juice do so.This all depends on the sweetness of your guava fruit. You control the flavor. 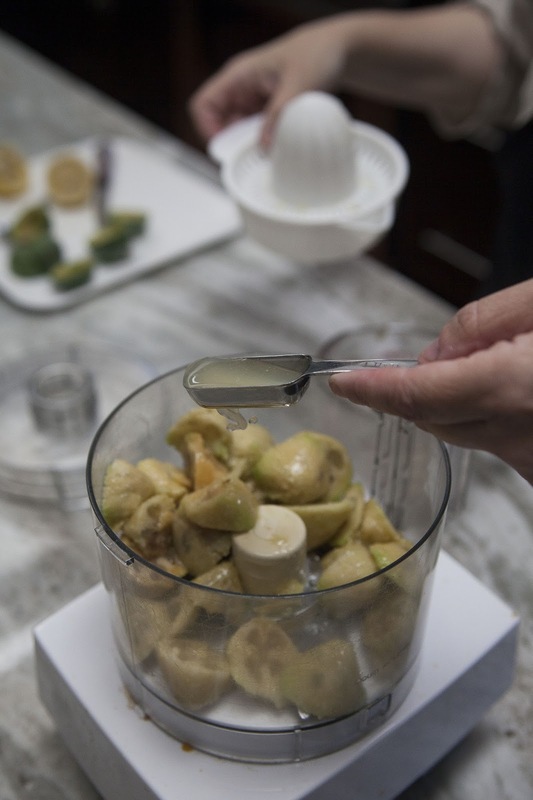 Pour the guava puree through a sieve and into a bowl to remove all the little seeds. 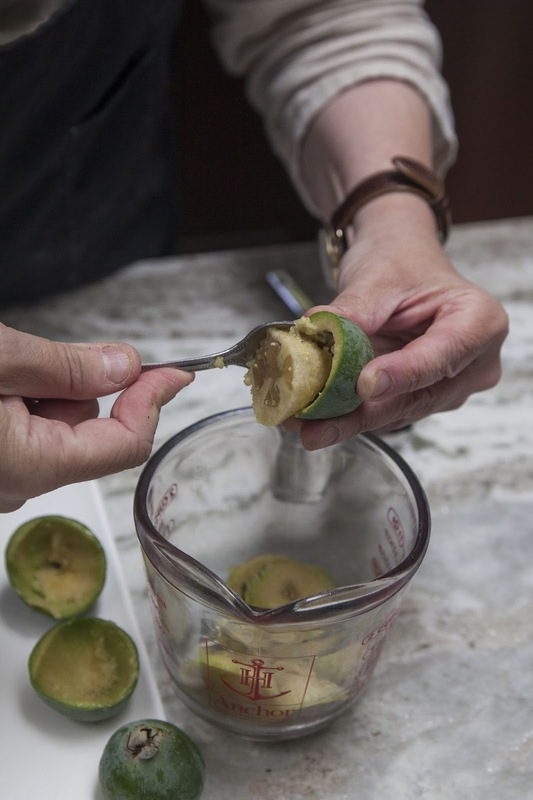 Pour the strained guava puree into a Pyrex dish. Stir it with a fork every 30 minutes or so, or you can just leave it. 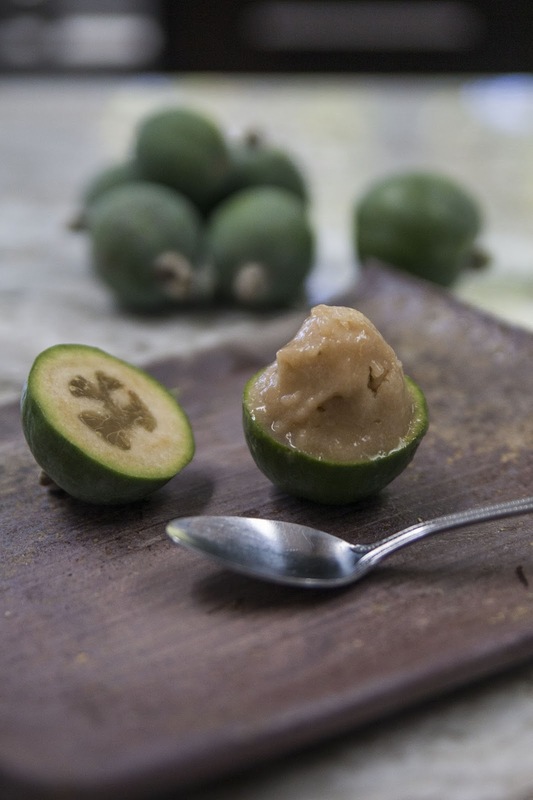 When you're ready to eat it, put the frozen guava puree into a food processor and whirl it up til it's creamy. I shoveled mine into hollowed out guava skins and served them that way. This is such a great post --- I do the same thing in Los Angeles, troll the streets for neglected edibles! 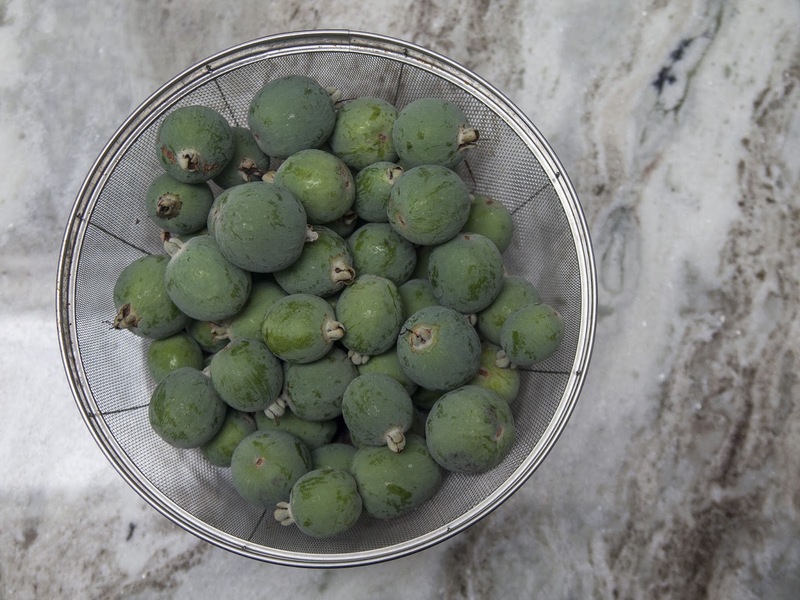 I have several guava on my kitchen counter now, and the scent is driving me mad! 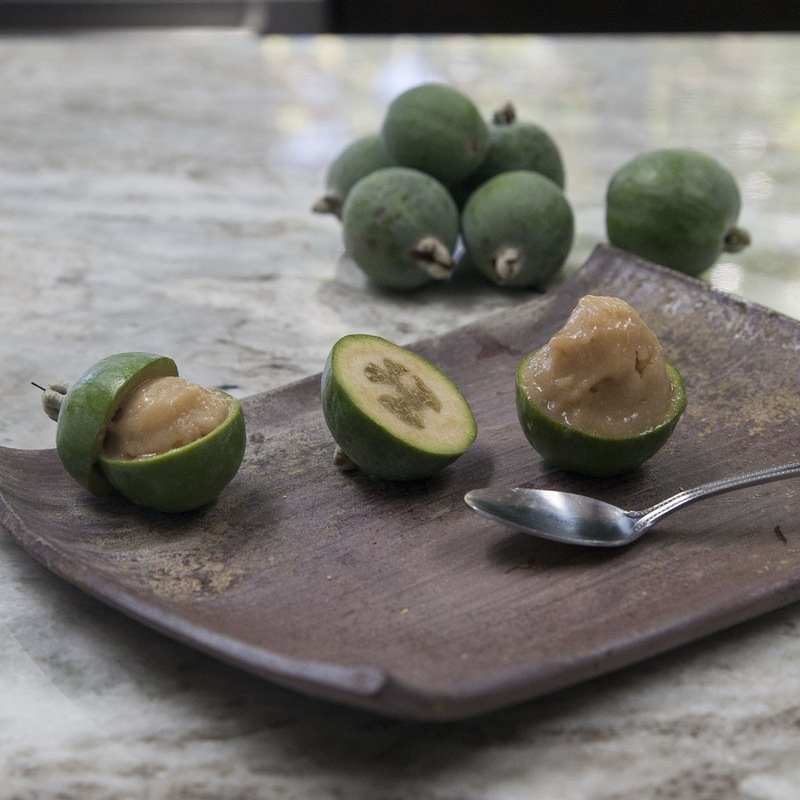 This 'sorbet' looks amazing, and I love how you serve it in the guava bowl. Thanks Sue, it always used to amaze me how people in LA never ate what was in their own back yards, especially loquats. The streets of Santa Monica were filled with them! !